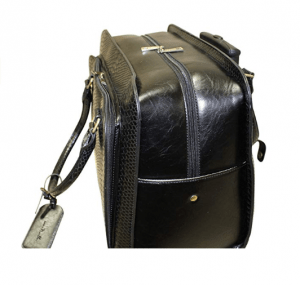 Simply Noelle Nile is a sleek and stylish smooth leather classic roller bag with a faux alligator scale design on the front and rear exterior. It is rated 4.6 out of 5 stars on the day of this review as a great quality bag that offers decent value. Your color options include black, whiskey, steel, red, light denim, and pearl. 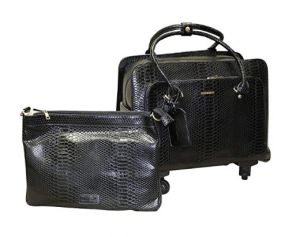 You’ll get a snap-off detachable laptop bag inside the roller bag, that also has the same faux alligator on the sides. It has the removable and adjustable crossbody strap, a strengthened bottom for more strength and durability and a zipper pocket. The main roller bag has the 360-degree rotating spinner wheels that offer easy maneuverability, with the help of the three-level adjustable telescoping handles. There is an ID card holder, an e-reader pocket, a smartphone pocket, a pen holder and the large front pocket organizer that you see in the photo. The total weight for this bag is 11 pounds and the dimensions are 16 x 18 x 10 inches. The removable laptop case is roughly 14.75 x 10.75 x 2.16 inches and fits inside comfortably. They will fit in the overhead bin above your seat on the plane, but not really under the seat in front of you. However you can fit the laptop bag in front of you after separating it from the main roller bag. Most airlines will let you have both a cabin bag as well as a separate laptop bag anyway. They are a bit bigger than they may look in the photos, but meet all of the airline luggage limits for cabin bags. You’ll find four good quality and durable spinner wheels underneath and they do not retract and can’t be hidden. They will stay out at all times. You can push the bag in front of you or pull it behind you easily on two wheels or alternatively roll it in a vertical position. This bag offers plenty of space inside and can be used especially for work purposes. And if you have stuff to carry between your office and home and on your business travels, it will be a great helper and will save your back and shoulder. You can easily fit in a very large screen laptop in the laptop case or the roller bag. We do not hesitate to recommend this Simply Noelle Nile Roller Bag at the price level as you’re getting what you pay for with it. All six colors look nice and the bag won’t be hard to pick at the terminal carousel among a crowd of bags due to the unique design if you ever have to check it in prior to your flight. One of the customers commented on the zipper being a little sticky, but other than that this is a great roller bag overall. And the laptop case will come in quite handy.